The most of the attention went on the first board with Valentina Gunina facing Salome Melia.the draw broke the string of victories Russian celebrated from Round 2 to the 8th round. The Georgian player had chances to get even more than a draw, but eventually a peaceful result was registered. Here better was 35.Qa6! with an advantage and the idea of 35...Bxc5? 36.Nd8!. Melia could play 59.hxg6! Rd6 (it turns out 59...Bxa5 60.g7 brings problems because white pawn passes, for instance: 60...Rd2+ 61.Ke3 Rd8 62.Nf8) 60.Rxa4 Rxg6. 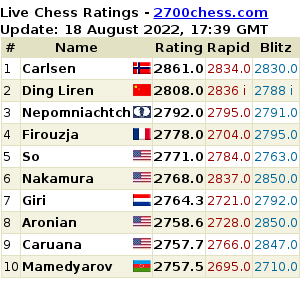 Balck of course has chances to draw but those are just not guaranted... Exaclty this position was analysed by the rivals after the game. The readers will definitely notice the leader has a new haircut again! From the other encounters of the day - we offer you a combination presented by Kashlinskaya. 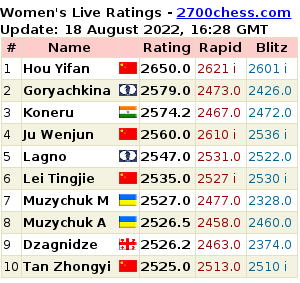 Three players are a point behind Gunina after 9 rounds. She hasn't faced only one of them - Tatiana Kosintseva. Thus the pairings for the next round was quite obvious.